The pretty purple Elgento E24005 microwave includes a hefty 17 litre volume, easy to use controls, and an ample power output. Purple finish, well made, looks good and works well. If you don't like purple, you may wish to check out this model in different colour schemes. Purple microwaves are pretty rare - if you're looking for the perfect purple appliance to finish off your kitchen, then your choice is fairly limited. Thankfully Elgento have released the E24005, a rich purple coloured solo microwave, offering a series of easy to use features from it's two dial control system. Not only is the Elgento E24005 easy to use, but it works very well, especially considering it's inexpensive price tag, impressing our testers by cooking food well. Capacity is pretty decent, with a mid range 17 litre volume, and it's powered by a more than reasonable 700w output. Overall it's well worth the low price tag. 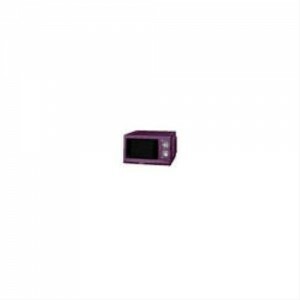 An ideal purple microwave for your kitchen - the Elgento E24005 works well, decent quality construction - buy one today! The Elgento Microwave range includes the Elgento E24001 (white), Elgento E24002 (black), Elgento E24003 (red), Elgento E24004 (cream), Elgento E24005 (purple) and the Elgento E24006 (pink).